About 2 weeks ago, I featured the very simple & elegant Chinese collared abaya from Damasq and this week I’m featuring one of Hijabi’s (Damasq’s sister store) maxi hijabs, which I’ll tell you more about further below! This look is basically what I would wear to go shopping or for ice-cream at the beach. 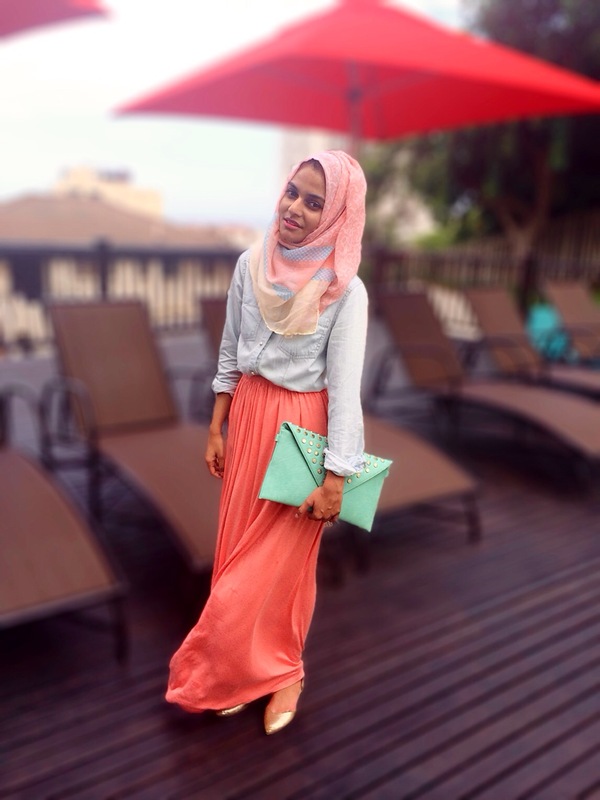 It features two of my favourite colours, coral and mint, and two of my favourite pieces of clothing – a denim shirt and a maxi skirt! So you could say that this is one of my favourite looks ever! Okay, maybe not ever, but you get what I’m saying! 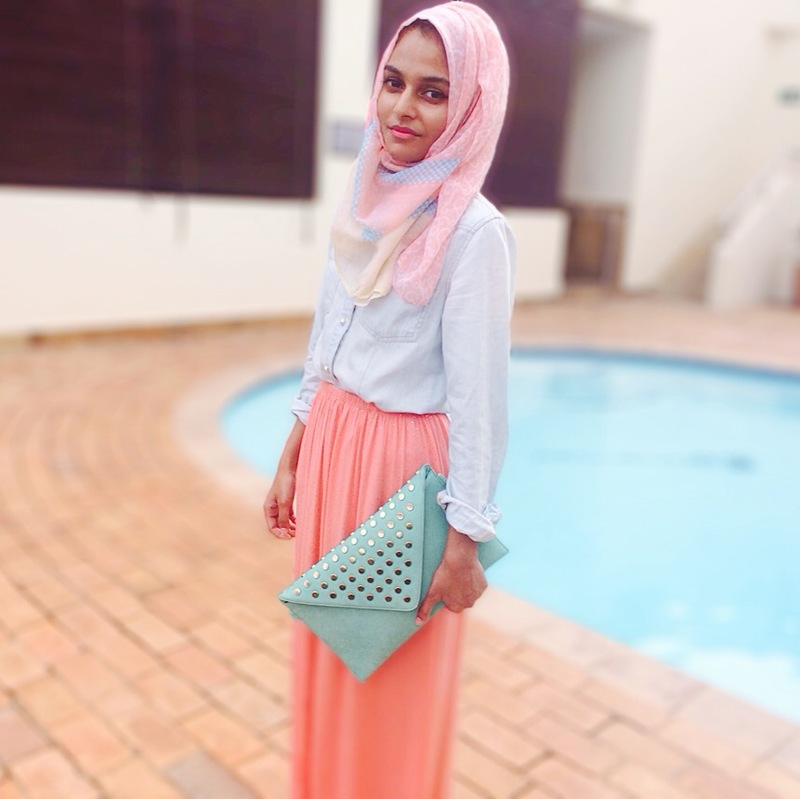 My outfit was actually inspired by the scarf that I’m wearing, which is the Summer Swirls Maxi Hijab ( it’s a maxi because it’s almost double the size of a normal scarf 😱) which has an array of colours ranging from coral, lemon, blue and a bit of beige too. I tried to incorporate each of those shades into my look to create a very bold but harmonious look. The gold D’Orsay pumps is my interpretation on the shade of lemon in the scarf and the denim shirt is obviously inspired by the shade of blue. I already had a ton of coral in the form of my maxi skirt and the pearly buttons on my shirt was an ode to the beige in the scarf. 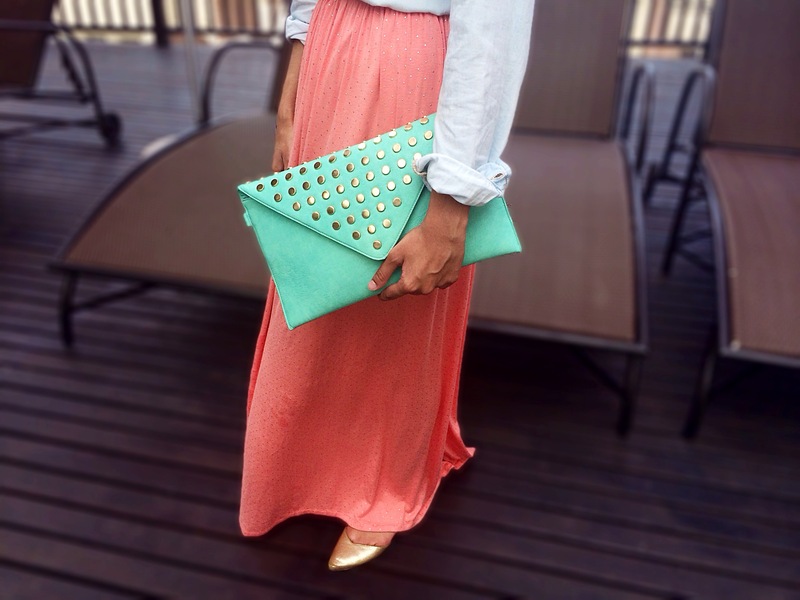 And the mint clutch is just there because it works and I think it’s fab! See how easy it is to create outfit colour combos from a printed scarf?! That’s the trick to creating a really colourful but complimentary look. You can find the Summer Swirls scarf here plus there’s various colours of the same print available, so do check that out too! The maxi hijab is also wonderful for creating a turban, the different colours crossing over each other make for such a pretty look!